November | 2010 | E-verything! We were a very small group for our recorded Serendipity unconference webinar this week. I think this was the combination of Thanksgiving in the USA, nearing the end of the academic year in Australia, and the fact that the conference season is still in full swing. We tend to have very low numbers at this time of year and this usually improves after Christmas. We didn’t really formally decide on a topic for this session, one just “grew” out of the initial conversation. My interest was sparked by a references to “Sprite’s Site by Jo Freitag (@jofrei). Jo told us about her cartoon character Sprite who is twice exceptional (2E). Sprite is a gifted student with a learning difficulty/difference. This session was fascinating as Jo told us about (and gave us links to) Sprite’s Site where you can read about Sprite and her learning journey. We also heard about the Gifted Resources website that Jo coordinates. This is an information service for parents, teachers and service providers involved with gifted students. Jo also mentioned #gtchat on Twitter, a weekly forum for discussion around gifted issues. This session was very exciting for me with lots of “take-aways” about the issues 2E students encounter that will help me with my own students. It has also made me think about how I might better organise the resources I use regularly for literacy and numeracy and make them more accessible for others. Our next Webinar is an Edublogs “Fine Focus” session. This week we have a treat in store as we will be joined by Sue Waters (@suewaters) the Edublogger. Sue is going to share her ideas and strategies relating to one of the topics suggested on our Wallwisher. The topic is ” How to manage using more than one Web 2.0 tool (incl social networks, virtual worlds and other comms tools) at once for education.” This is guaranteed to be a lively session as Sue’s sessions always are – she certainly always keeps me on my toes as a moderator! If you are a regular visitor to our webinars you will know that we alternate “Fine Focus” sessions on specific topics with “Serendipity” the unconference sessions where we choose a topic by poll at the start of the session. Sometimes the very fact of being asked for “hot topics” or other ideas for discussion or learning tends to make our minds blank. This has prompted me to start a Serendipity Wallwisher for topic suggestions. Please visit the wall and add your ideas for Serendipity topics so that we have more choices to consider. Some of these ideas might also form the basis for future “Fine Focus” sessions. 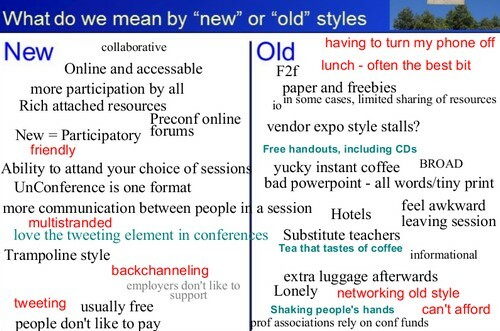 In this Edublogs Fine Focus session (recording here) We took a look at the way conferences have changed/are changing and the pros and cons of the tradional compared to the new style for participants. This topic was triggered by the number of virtual conferences I have participated in as attendee or presenter this year compared with the fact that I have attended no face-to-face ones at all. We started with a look at our own perceptions of what constitutes a “new” style conference in comparison to what typifies the “old” style conference. We also did a quick poll on what sort of conferences (if any) we had attended this year. After sharing our various understandings of old and new style conferences. We moved on to consider what we felt were the advantages and disadvantages of each. This provided food for thought and certainly raised a couple of advantages of the traditional style that hadn’t occurred to me. Personally I love virtual conferences as they allow me to “conference” in comfort from home & make it much easier for me to attend global events. This session was very active as everyone had lots of ideas about new and old style conferences. For the full “flavour” catch the recording. On a personal basis I’m not sure I did a very good facilitation job on this Fine Focus, I didn’t have much time to prepare and was also a bit distracted by the fact that I was due to present at the online Global Education Conference #globaled10 an hour after the end of the session. Of which I will be posting soon. 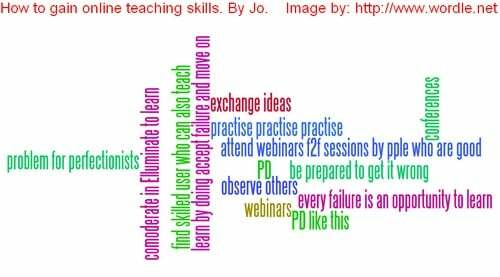 For this recorded Serendipity unconference webinar we took a brief look at the skills needed for online teaching and at how we could gain those skills. Unusually for our sessions all of us attending were based in Australia – I suspect this was because most of the USA has just had a clock change with clocks going back one hour. Changes to and from “summer time” always have an impact on the geographical locations of our attendees for a couple of weeks. We used whiteboard and text chat a lot during this session as well as audio because we had people without microphones, so it was very much a blended session. Lots of ideas and suggestions were made on the whiteboard both for the skills needed and how to gain them. This is a good thing for me to reflect on as I often suggest once a topic is chosen that we seek a common interpretation before we start the discussion. However in unconference webinars such as Serendipity should I even be doing this? What do you think? This session was fun – we went a bit feral at the end and played with Elluminate giving everyone Moderator so that they could see the extra tools available to moderators. 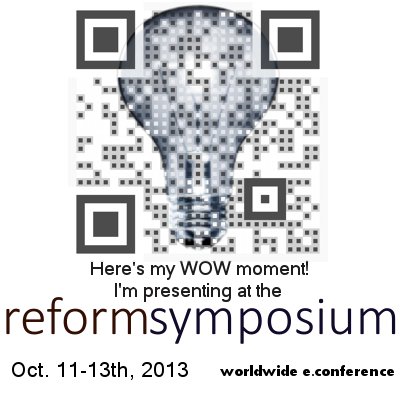 Exciting News – Upcoming Conference! Remember to check out the sessions at the Global Education Conference happening all of this coming week. There is no registration required you just click on the Elluminate link (these will be available from the session information). The theme is “globally connected education” and is totally cross-sectoral aimed at anyone involved in any way in education and/or training. There are sessions on many different aspects of online collaboration and connection betweeen students, educators and the wider global community. 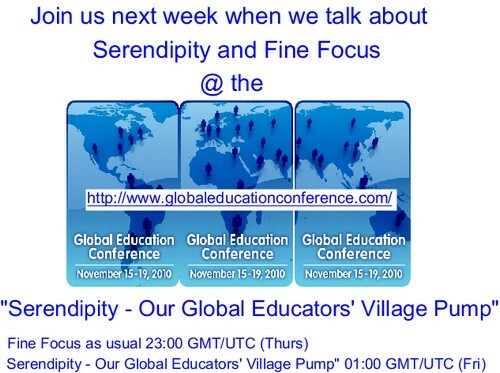 There are around 350 presenters from all over the world (including a session about our Serendipity/Fine focus webinar series at 01:00 GMT/UTC on Friday – one hour after the end of the usual Fine Focus session). We would love your input/participation in the session, especially so if you have participated in the Serendipity/Fine Focus series of webinars as they have evolved. This is an opportunity for us to look at where we are and consider our future direction! Our next Webinar is an Edublogs “Fine Focus” session. This week in “Conferences – they are a’changing” will be a discussion about the changing face of conferences and some of the pro’s and con’s of the old and new style of conference. Overview Edublogs webinar – Face to Facebook! In this Edublogs Fine Focus session (recording here) Jane Curry (@parrpakala on Twitter) introduced us to the way she is using Facebook to enhance and improve the learning experience for “English as a Second Language” learners. This was an exciting session not only because of the way that Jane is incorporating Facebook but because she also included some of her students in the session. Jane teaches English as a second language at Swinburne TAFE (public vocational education) in Melbourne, Victoria, Australia. Jane’s students are migrants/refugees. Migrants to Australia have an entitlement to some English language classes when they arrive. The programme usually used is the Certificates in Spoken and Written English (CSWE). This is multi level and outcomes based, students need to demonstrate that they can read, speak and write to the relevant level. So any opportunity to practise reading, writing or other forms of communication in different ways is very welcome. 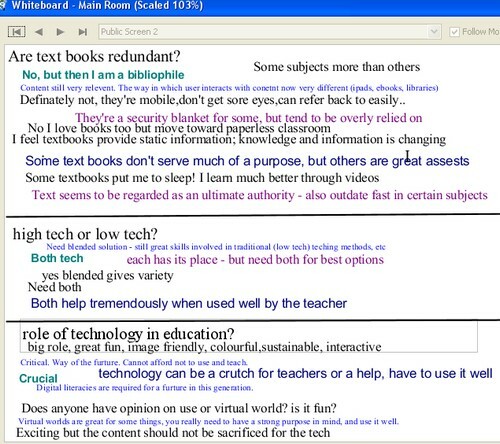 and also demonstrated how she uses live chat with her students. There were a variety of questions and ideas raised in text chat around the practicalities of using Facebook particularly with second language learners and privacy issues relating to its use. Jane responded to these during the session. The highlight was when two of Jane’s students bravely joined her at the microphone and answered some questions from us about: where they were from; what they though about using Facebook; and whether they had Facebook friends elsewhere. This session was very exciting as it is the first time we have had students taking part in this way and I think that both Jane and her students were very brave to be prepared to do this. Jane did a great job, she has not had the opportunity to join many sessions as her class coincides with webinar times and this was her very first session as a moderator. As always this overview gives only a taste of the session. For the full “flavour” catch the recording. High tech or low tech? Role of technology in education? For me and I think perhaps for most of us in the session these three are closely linked so considering them together was an effective strategy. We decided to take a blended approach with one whiteboard containing all three titles for ongoing thoughts and ideas rather than try to split them up and keep flipping between whiteboards. There is potential in this kind of discussion for using three boards and enabling “roaming” so that participants can move between whiteboards at will and add their ideas to the relevant board. However the several new Elluminate participants in the session would perhaps have been somewhat disadvantaged by this. While the whiteboard gives a snapshot of the session the recording will give a much more complete and rounded picture of the discussion. There were several participants without microphones so the text chat was very busy, we also had great audio contributions. Our next Webinar is an Edublogs “Fine Focus” session. 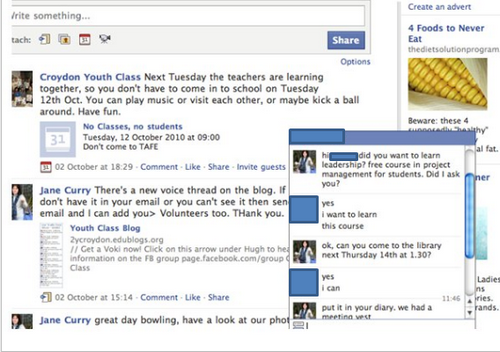 This week in “Face to Facebook” Jane Curry will Elluminate you with ideas on how to use Facebook with ESL youth. There are so many ways of collaborating on FB with a group of students, teachers, volunteers and social workers and other friends. Photography, discussions, posts, chatting, links to wallwisher, youtube, events and that’s not all!! Collaborative teaching and learning, ….we are all learning. Jane is an ESL teacher at Swinburne TAFE (public vocational education) in Melbourne, Australia & is working with Migrant refugee youth. Jane developed an interest in media and literacy when working in remote bilingual aboriginal schools in the NT in both primary and adult edn. She is now transferring those skills and ideas for teaching and learning in a collaborative way to her youth class using Facebook, Edublogs and online Web2 tools. The Youth Program also have support from Foundation House and CMY with a focus on employment skills and work experience.